Join us for a session about radiation and nuclear decay! Our speaker this month will be Prof. Chunhui Du. March 9th: Follow the wave! Let's shake some strings together this month to learn about all sorts of waves! Get ready to learn about optics as wells as acoustic waves! Join us this month and make your own wearable circuit board! Our speaker will be Prof. Vivek Sharma, an experimental particle physicist. January 19th, 2019: Shockingly fun! This month, come learn about electrostatics with YPP. Labs and demos will teach you all about fields and charges! Our speaker this week will be Prof. Tarun Grover who will teach us about phases of matter! December 15th, 2019: Spinning around! This month, YPP will get your head spinning! Come learn about angular momentum and why things around us keep spinning! November 17th, 2018: Get egg-cited! Come join us for a fun morning featuring our annual egg drop competition! We will supply materials, so all you have to do is let your imagination run free and make sure your eggs don't break! Our speaker will be astrophysics Professor Quinn Konopacky. Note that this event will be covered by UCSD's Divison of Physical Sciences Communications team. October 13th 2018: YPP kicks off the school year! October 13th will mark the start of the YPP school year, and we are very excited to be back! We have some fun and interactive demos in store centered around the themes of momentum and energy. Our speaker will be Philbert Tsai, one of the most popular lecturers in UCSD's physics department. See you then! May 13th will be our final YPP lab of the year on 'modern physics'. Students will learn about nuclear decays and when radiation isn't so scary. Our speaker will be condensed matter theorist Prof. Tarun Grover who will give a lecture on "Chance in Everyday Life"! See you then! April 2017: Touring the Town! Apr 8th was our day of lab tours where students get to see and hear about some of the exciting work happening at UCSD! Mar 11th was our lab on waves and optics. Students explored the properties of sound and light, bringing things into focus. Our speaker was particle physicist and YPP Co-Director Daniel Klein who gave a lecture on his work understanding the results of collider experiments at the LHC. Feb 11th was our lab on electrodynamics and magnetism. Students learned from the motion of electric charge just how magnets work! Our speaker was astronomer Nick Galitzki who gave a lecture on his work building and launching balloon telescopes in Antarctica. Check it out here! Jan 14th was our lab on electrostatics. Students learned some shocking facts about electric fields and charge. Our speaker was astrophysicist Prof. Karin Sandstrom who gave a lecture on her research into the formation of stars. Dec 2016: A Dizzying Day! Dec 3rd was our lab on angular momentum. Students learned from spinning wheels and gyroscopes why the world keeps turning! Our speaker was condensed matter physicist Prof. Julio Barreiro who gave a lecture on his groups work on building a quantum computer! Nov 5th was our annual egg-drop competition. Students applied what they learned from last lab, as well how forces change momentum!, to build devices which let their eggs survive several story drops! Our speaker was condensed matter theorist Prof. Tarun Grover who gave "An Introduction to Quantum Mechanics", explaining the strange and beautiful physics visible at nature's smallest scales. Oct 8th was our lab on momentum and energy. Students learned how the seemingly simple statement of conserving both let's you predict collisions and the motion of falling objects. Our speaker was particle physicist Andrew Kobach who told the story of how this principle led to the discovery of the neutrino and is important in understanding physics at all scales. 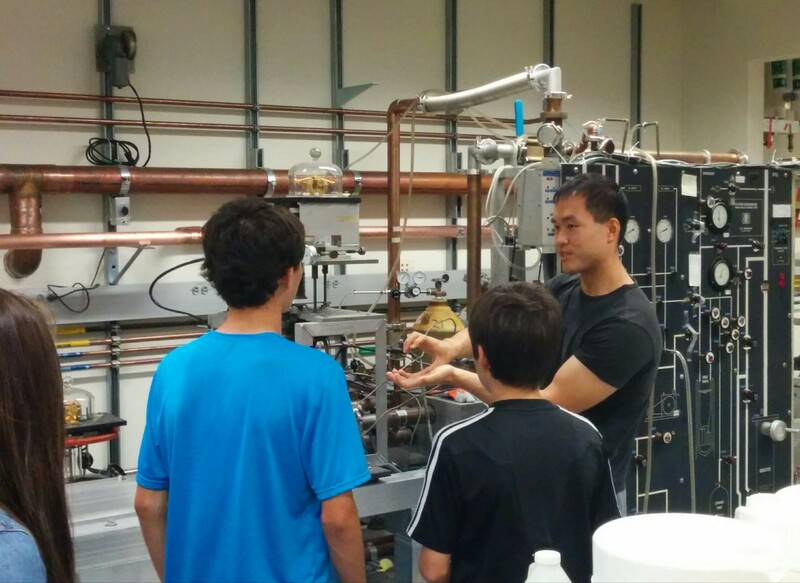 Our next meeting on May 21, 2016 will be lab tour day! Experimental labs will be open to participating students. Don't forget to register by May 7th for this event. The next YPP meeting will be on May 16th and will focus on radiation and modern physics. Our speaker is Chris Schroeder, researcher at LLNL. Registration is now open; see you then! March 28th was our lab on waves and optics. Students learned about interference, in sound and jump-rope, as well as how lenses focus light. Our speaker for this week was Professor Julio Barreiro who gave a lecture on waves and quantum mechanics. The next YPP meeting will be on April 25th and will be primarily a series of tours of our experimental labs here at UCSD. Registration is now open; see you then! February 21st was our lab on electrodynamics and circuits. Students learned to solder and craft their own blinking accessories as well how electrical energy can be traded with mechanical energy through the power of induction. Our speaker for this week was Professor Michael Fogler who gave a lecture on the incredible properties of graphene. The next YPP meeting will be on March 28th for our optics lab. Students will learn about lenses and general wave phenomena. Registration is now open; see you then! January 17th was our lab on electrostatics. Students learned about charge and how it can be used. We also learned about Faraday cages and why a car is safe in a storm. Our speaker for this week was Professor Hans Paar who gave a lecture on his research in cosmology and our place in the universe. The next YPP meeting will be on February 21th for our wearable circuits lab. Students will learn the basics of circuit design and even how to solder their own electronic jewelery! Registration is now open; see you then! On November 22nd we held our annual egg drop competition. Students competed in building landers to allow their eggs to safely hover down a 4 floor fall! Our speaker for this week was Professor Eric Fullerton who gave a lecture on magnetism and its use in recording media such as harddrives; something increasingly important in our day-to-day lives! The next YPP meeting will be on December 13th for our angular momentum lab. Students will learn about the stability of gyros and get dizzy with flywheels! Registration is now open; see you then! On October 25th, we kicked off YPP for the 2014/15 school year with a session on momentum and energy. Students saw how potential energy could be converted into kinetic energy when we rolled ball bearings down PVC tubes, and they saw how momentum was conserved using carts on a low-friction track. We also saw energy and momentum at work in rockets, diet coke & mentos geysers, Newton's Cradle, and many more! Grad student Emily Nardoni gave a talk all about physics at different size and energy scales in the universe. Incredibly, we had about 3-4 times more people preregister for YPP than we normally do! Although we were thrilled to see so many people interested, we weren't able to accomodate everybody, and had to turn some participants away at the door. We're very sorry to those we couldn't accomodate! If you're on our email list, you should have received a message explaining the circumstances, and what we're doing to make things better for our next session. In particular, if you were turned away in October, make sure to email ucsd.ypp@gmail.com so we can give you special priority next time you attend. 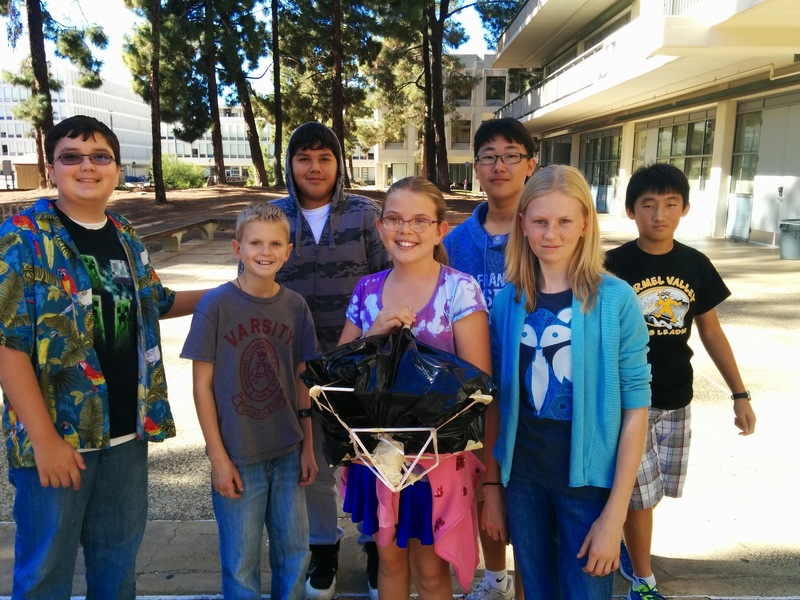 Our next YPP meeting will be on November 22nd, where we'll conduct an Egg Drop Challenge! Students will be tasked to build contraptions that will allow them to drop an egg from various heights without breaking the egg. We hope you'll join us! On May 17th we concluded YPP for the (academic) year with a look at physics in the last century. We demonstrated radiation shielding and half-life while realizing that nuclear events are all around us! We also saw the fingerprint of elements in their electronic spectra and made liquid nitrogen ice cream. The next YPP meeting will be in October, 2014 where we shall start anew for the academic year. If you'd like to stay up-to-date consider sending a message to ucsd.ypp@gmail.com to be added to our mailing list! See you then! On April 19th we explored the basements and rooftops which house many of our experimental labs. We learned about everything from frozen atoms to the fingerprint of the big bang! Here's a list of labs which participated: Maple Lab, Butov Group, Non-neutral Plasma Group, Schuller Lab, Cosmology Group Many thanks to them and their students! The next and final YPP meeting for this year is on Saturday, May 17th, 2014. We'll leap into modern physics and see why radiation/nuclei aren't so scary. See you there! On March 8th we let there be light and studied the general properties of waves. We learned about standing modes in slinkys, the Fourier spectrum of a guitar, about lenses, and about the intense power of the sun! Our speaker this month was David Kleinfeld who uses techniques from physics to image the brain! The next YPP meeting is on Saturday, April 19th, 2014. We'll be taking tours of the many experimental labs in the department. See you there! Induction Junction, What's Your Function? On February 15th we learned that moving charges create magnetic fields and how people use this to create motors and generators. We also played with Tesla coils; a truly dramatic application of induction! We also had an extended lab session, where students learned to solder their own blinking LED circuit jewelery. Quite in this season. The next YPP meeting is a little early on Saturday, March 8th, 2014. We'll combine what we've learned so far to study electromagnetic waves: light! On January 18th we brought YPP to the year 2014 and learned some shocking facts along the way! We explored the nature of charge, how it moves through materials and even ourselves! Our lecture this week was thanks to Prof. Eva-Maria Schoetz Collins who explained to us the interesting physics behind regenerating flatworms. The next YPP meeting is Saturday, February 15th, 2014. Having understood charges at rest we will set them in motion! Hope to see you there! On December 14th we concluded YPP for the year by playing with spinny things! We saw that angular momentum both exists and is conserved, which can explains why things rotating are more stable and how ice skaters twirl faster. We also rolled various objects and saw how both the shape and the mass determine how fast they go! Graduate students Shauna Kravec and Eric Calman then talked about the interesting physics in two dimensions (which you can get by smushing a crystal very thin) and how, when you make things cold, you can see some of it. The next YPP meeting is Saturday, January 18th, 2014. Placing mechanics in our toolbox we will try to understand objects which have electrical charge! See you then! 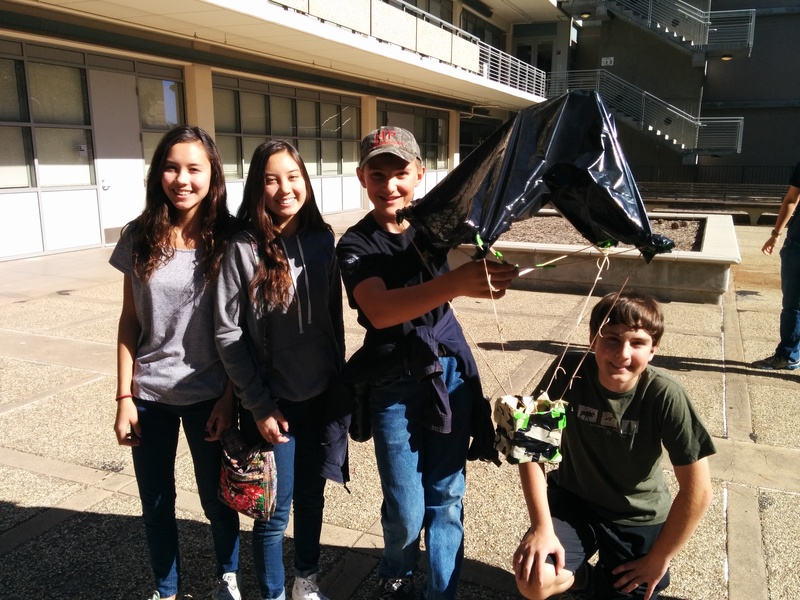 On November 16th we had our second annual egg drop competition. Unlike last year where students made containers to safely carry their eggs to the ground, this year featured a 'naked' egg drop. Teams of students built contraptions out of household materials that were able to keep an egg from breaking - even when dropped from 4 floors above. The lecture this month was provided by Professor Hans Paar. Prof. Paar does his research on the fundamental structure of the universe. The next YPP event will be Saturday December 14th. 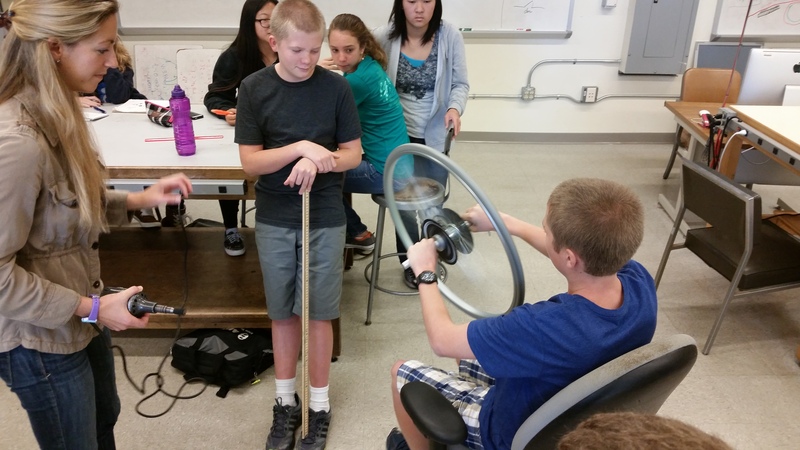 We will be getting dizzy with demos and labs on rotation, angular momentum, and torque. We had a few hiccups in starting YPP this year and had a our first meeting a bit later than usual on October 26th this year. Nevertheless, the fun and the learning and the physics continued on! We learned about conservation of momentum and conservation of energy and tested our understanding (and trust) of these principles by flinging bowling balls at our faces (see images above). There were no broken noses- phew! Conservation of energy and momentum still hold true. Graduate students Chris Knowlton and David Stone talked about cats tracking mice with their computers (their brains, that is), and about the Five story Swiss watch that are the ATLAS and CMS particle detectors at the Large Hadron Collider (LHC) at the CERN science center in Geneva (a link to the trailer about this movie, "Particle Fever", is here). The next YPP meeting is this Saturday, November 16th, 2013. Here we will apply what we learned about last week by dropping eggs into clever designed devices that should prevent the eggs from destruction upon impact. The physics principle that will help us save our eggs is the impulse-momentum theorem (a more technical discussion from Wikipedia here), which we will learn about. This important concept in physics is what helps us design safe cars to protect us in road accidents! Come join us as we put all of our eggs in one "basket" (that is carefully designed to account for the principles of the impulse-momentum theorem)! Participants should be at the YPP meeting location by 9:45 AM. Directions to the meeting can be found on the About page of this site. We started out fairly conservatively with our momentum and energy lab. We found that for every action there is an equal and opposite reaction - sometimes leaving soda all over the place. In November we had our first annual egg drop challenge student. 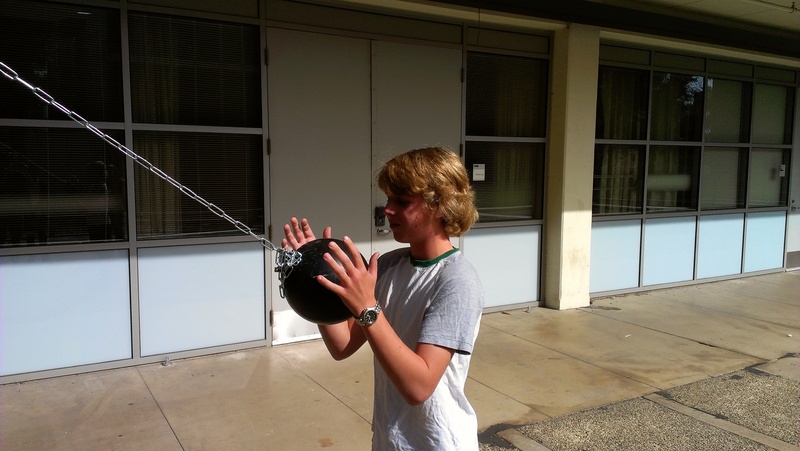 Teams of students competed to see who could build the smallest, lightest, and most created way to protect an egg dropped off a building using limited supplies. December was all about what makes the world go round. We examined how spinning objects want to keep spinning the same way they are currently spinning, and how that relates to everything from which star is the north star to how satellites are able to point in the right direction. The Continuing Adventures of YPP Website-Admin, the Site's Registration Page, and the Next Meeting! But never fear! YPP's November meeting is here! This upcoming meeting will focus on learning about the important and fundamental concepts of linear momentum and energy conservation. We will be bashing things together and flying things off ramps- all in a controlled, and certainly calculated manner! The principles that define these concepts be very powerful tools that we will teach the students how to use. This is the same knowledge that any engineer or physicist uses to do everything from properly launching rockets into space to smashing together protons and anti-particle protons in particle accelerators at cosmic energies. By the way, we'll be launching a rocket of our own, though sadly it won't be going to space. See you there! The 2011-2012 Young Physicists Program Starts Saturday, October 1st! Get ready for the next school year of YPP! Our first meeting will be on Saturday, October 1. The topic will concern the basics of correct scientific measurement and will be spiced with discussions and examples that show the ubquity and power of π (that's 3.151492653...) in many physical measurements and situations. The meeting will start promptly at 10 AM. More information about the lab can be found under the Schedule/Labs section of the website. Directions and other information about October's program, as well as information for the rest of the year, can be found under the About section of the website. At this time you cannot yet register for the first meeting, as the registration page is still under construction. This should be corrected shortly and information will be posted on this front page when we have information to update you with!See you there! As has been promised for over a year now, the YPP website has finally left the Geocities era and now looks more modern and appealing. As one would expect with such a big jump, there will likely be a few hiccups in the website as it gets started. As noted at the footer at the bottom of each page, please email us if you find anything odd or dysfunctional with the site. We appreciate any other input, such as suggestions for improvement, and would like to thank you ahead of time for bearing with us while we straighten out the site. Send away any bugs you find! Pizza is served at all YPP meetings! Design taken from Free CSS Templates.